Renowned French music festival, Le Cornouaille, hosted several world-known artists including Steve Hackett (Genesis Revisited), Dan Ar Braz, Murray Head, Salif Keita, and Goran Bregovik among others. 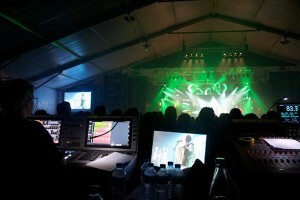 The festival, held in the French region of Brittany, featured three main stages each supported by several of Harman’s Martin lighting consoles and luminaires. French rental company SIWA provided the gear. Lighting of the main stage, "Espace Gradlon," was controlled with a brand new Martin M6 console operated by François Guillet of Lumières Utiles and Jo Nihouarn of SIWA. "The M6 T-Bar and CITP are very powerful tools for improvisation. The M6 allows me to choose media directly with media thumbs and crossfade smoothly between video cues and media speed. I really enjoy working with those two splendid tactile screens," commented Guillet. The lighting desk was backed up with a networked M1 console. Additionally, 12 LC 2140 LED panels paired with a Maxedia compact were deployed. The second stage, "L'Evéché," was illuminated by a full LED design without the need of bulbs, discharge lamps or halogens. Controlled by a M1 console, the stage featured 8 Mac 350 Entour and 12 MAC Aura LED profile fixtures. "This is our second show with this green design that includes 60 fixtures, par cans, profile, Fresnel or LED Bar and only 3x10A," explained Yves Guegan, CEO, SIWA. Maxime Saint Bonnet and Erwan Corre of SIWA controlled the lighting using a conventional desk plugged in with Martin’s DMX Interface to adjust the front lights and effect speeds. "The DMX Interface is a very simple feature of the M Series that provides good control solutions," added Guegan. "Saint Corentin" was the third stage reserved for Breton Dances, the traditional dance of the Brittany region. "Saint Corentin" was illuminated with eight Mac 250 Entours controlled by an M1console."